Famous Natchitoches, LA Meat Pies, Inc. (better known as Natchitoches Meat Pies) has been in business for over 30 years, perfecting our unique empanada (crescent filled pastry). We started in 1982 with the original beef and pork meat pie and continued to add different pies to meet the ever growing demand for new flavors. 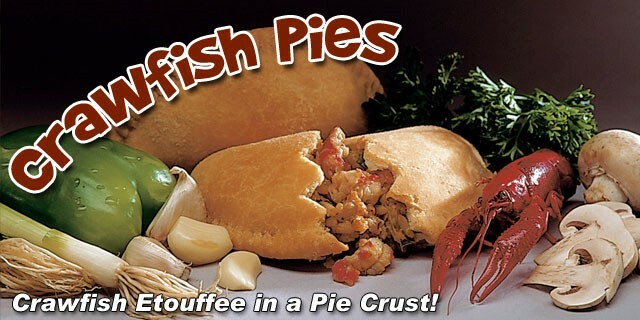 The state crustacean is always in large demand in Louisiana, so we added our crawfish pie in 1990. This local favorite continues to grow in popularity regionally and nationally as curious "seafood" lovers try it and discover why Louisianans have been enjoying crawfish for generations! Once people got hooked on our "lunch" and "dinner" meat pies, we felt the need to meet the burgeoning demand for a "breakfast" pie, hence the chorizo with egg & jalapenos for the more daring palate. For those who don't eat pork we offer our lean beef only (New Orleans Style) pie. The 1.25 ounce pies are typically served up as snacks and appetizers, while the original four ounce pies make a great entree. We continue to add pies as our ever-growing and much appreciated customers' desires dictate. We now offer fillings, flavors, styles & sizes for nearly every occasion, setting, meal & course. It's no coincidence many of the cooks finding fame on the popular TV food shows are from Louisiana. 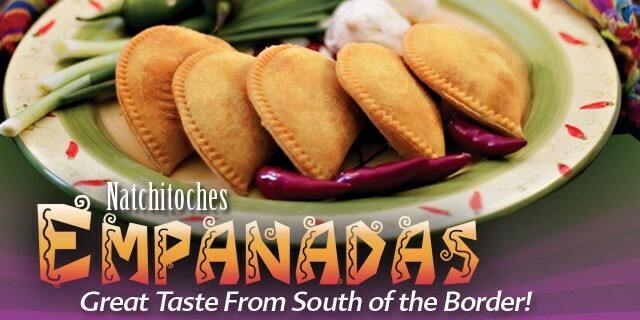 Taste the original Louisiana empanada, the Natchitoches Meat Pie, perfected and produced right here in Coushatta, LA. We're confident you'll love it! Are you in search of delectable snacks, favorite party foods, or hearty meals? This is the place to find it all. 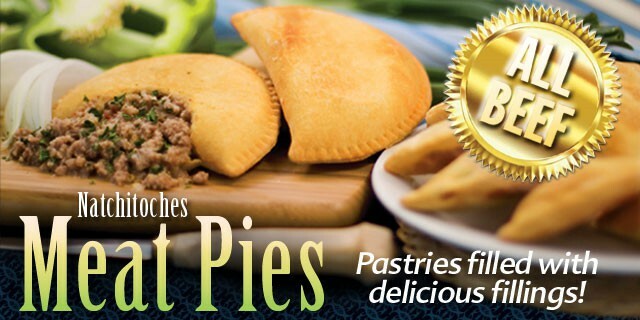 At Natchitoches Meat Pies, you’ll find an irresistible array of meat pies with down-home recipes and Cajun flavors. Our famous empanada recipes are second to none and our original recipes give you a one of a kind taste experience. 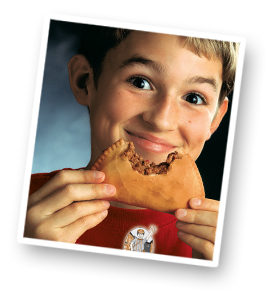 Since 1983, we’ve built a reputation for the best original pork and beef empanadas. In the thirty years since we began, the Natchitoches Meat Pies empire has expanded to include crawfish pies and other down-home favorites. Read more about our delicious empanada options. Original Meat Pie—Our delicious original meat pies include zesty Cajun flavoring and come in entrée and appetizer sizes. 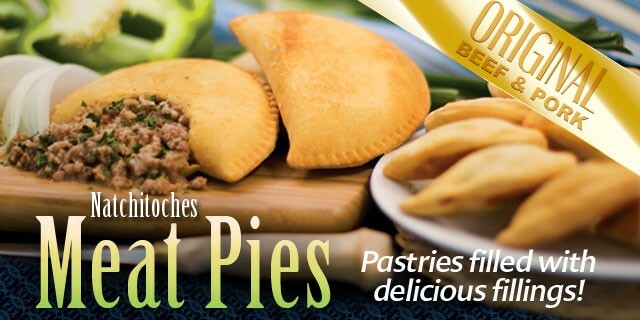 Find favorites like Beef and Pork Pie, Spicy Meat Pie, and New Orleans Style Meat Pie. Seafood Pies—Introduced in 1990, our crawfish pie has quickly become one of our top sellers. We also feature a shrimp pie, which has a spicy flavor with a New Orleans Shrimp Creole inspired recipe. Breakfast Pies—Including favorites like Chorizo with Egg & Jalapeño. Enjoy an ever-growing menu of favorites from the down-home leader in original meat pies. 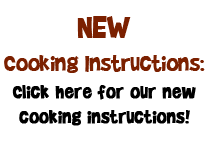 Since the very beginning, Natchitoches Meat Pies has been known for great service, unsurpassed flavor, and original recipes. When you want to add the perfect appetizer to an event, treat your family to a delicious meal, or serve a one of a kind dessert, we make it easy. Ordering with us takes minutes, which make serving our favorites even more appetizing. When you want simple solutions to small or large events, the Natchitoches Meat Pies team is standing by to help you build the perfect menu. From spicy favorites to new sweet treats, we’ve got everything you need to wow guests and treat your family to an unforgettable meal. 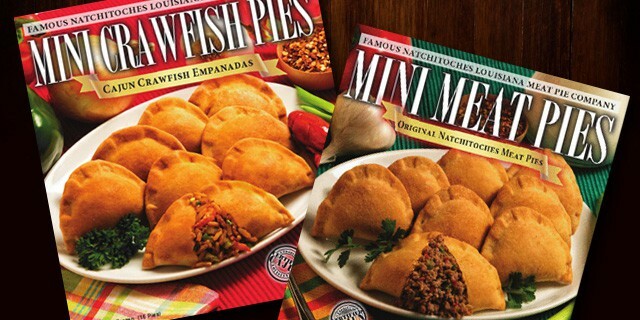 When you order with Natchitoches Meat Pies, you’ll enjoy fast shipping and stellar service from start to finish. We ship throughout the contiguous US, which means almost everyone has access to authentic Louisiana flavors. Enjoy the convenience of online shipping and tap into original flavors you won’t be able to resist. Let Natchitoches Meat Pies transform any special occasion with crawfish pie, empanada favorites, and other delicious items. When you’re ready to enjoy great taste from Louisiana’s empanada leader, we make it simple. Order online or contact us to get started. Our team is eager to help you build a one of a kind menu for any event. Whether you are picnicking with friends or throwing a fun-filled fiesta, we’ve got everything you need for a one of a kind experience.